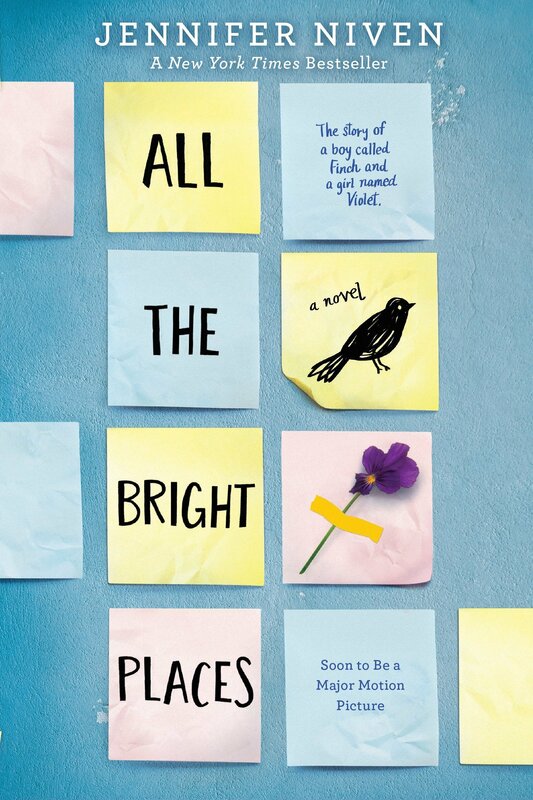 All the Bright Places by Jennifer Niven is a moving young adult novel about a girl learning to live from a boy falling apart. Violet Markley is a popular girl in her high school and secretly dealing with PTSD, since her sister Eleanor’s death in a car accident. Since the tragedy, Violet avoids cars and quit student council, cheerleading and writing for the online journal she had with her sister. Theodore Finch is captivated by death and struggles every day with finding a new reason to live. He suffers from an undiagnosed bipolar disorder and feels isolated and alone as his family doesn’t seem to understand what he is dealing with. They meet on the ledge of their school’s bell tower, both thinking of jumping of. Finch however, ends up talking Violet out of suicide. The two of them eventually become partners for a school project, resulting in them travelling around their state. They’re visiting wandering sites of all kinds, like a homemade roller coaster and the highest hill in Indiana and start to fall in love. Over time, Violet starts to heal. Unlike her parents, Finch gets her to talk about her sister’s death, to start writing and driving cars again. Yet, during this time, Finch starts to get worse. His father beats him, he is bullied in school, and Violet is the only thing in life, that keeps him going. Jennifer Niven created a new kind of romance story. Yes, it features the typical “the popular girl falls in love with the outsider” plot, but the trendy girl isn’t just a shallow cheerleader and the unpopular guy isn’t a nerd. Instead, both characters have depth and struggle with serious problems, that make them seem “weird,” to which many teenagers can relate. However, rather than romanticizing Finch’s fight with his bipolar disorder, Niven gets the reader to understand the seriousness of such an illness and raises awareness of how dangerous it can be if we choose not to help people that have depression. All the Bright Places is so touching and well written that in the end the reader feels as if he has been on the road trip through Indiana. The alternating chapters from Violet’s and Finch’s point of view particularly let you build an emotional connection to them, which is a rare accomplishment in the modern romantic novel genre. Lastly, thanks to Finch’s view on the world of always wondering about what there is to live for, everyone that reads the book understands how important it is to enjoy life to the fullest.